The best thing about selecting centerpieces for your wedding reception is that you get to scroll through a series of artistic tabletop photos splayed with elegant eye candy from which to choose! Whether you recreate the centerpieces exactly as they're shown, or mix and match different elements to create your own, the important thing is to enjoy all the room for creativity in this part of the wedding planning process. 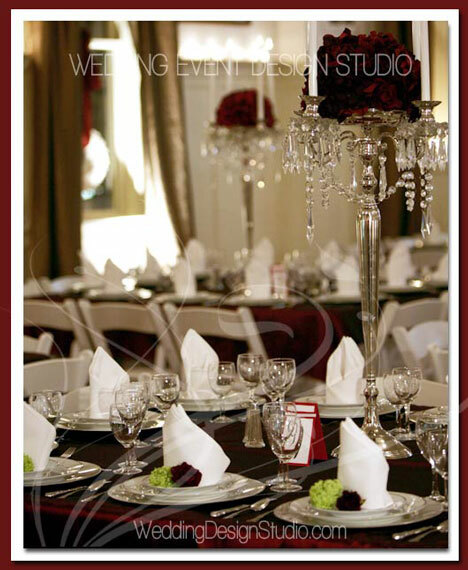 Unlike your quest for the perfect wedding dress, choosing decorations for your reception tables doesn't require trying anything on, or even worrying too much about matching colours, since flowers, beads, glass and sand come in so many customizable and complementary shades. Mixing fresh fruit with florals is becoming increasingly popular for wedding reception decor, and is a great way to add splashes of bold colour without splashing out too much cash. 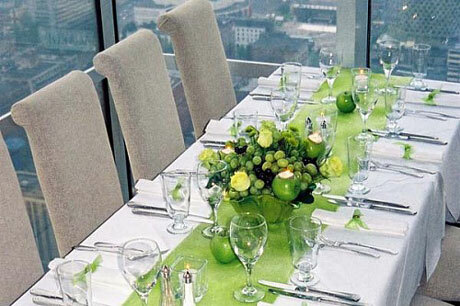 In this centerpiece (from Montréal table decor consultants, Intimate Settings, a table runner in spring green matches the apples that are featured in the bouquet and scattered about the table. 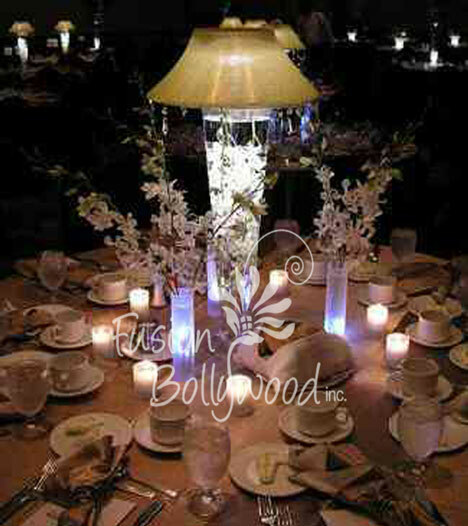 As this photo from event decor company, Fusion Bollywood (Calgary) demonstrates, nothing evokes atmosphere like the right combination of lighting, glass, water, and florals. The lampshade topping off the glass vase at the center acts as an umbrella, transforming the table into an intimate and inviting space. 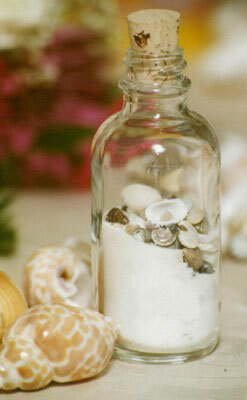 Beautiful for a beach theme and easy to DIY, bottles can incorporate a series of seaside tokens into your centerpiece, like this seashell and sand-filled bottle courtesy of Decor8 Events in Calgary. A photo of the bride and groom tucked into the bottle would unravel and expand once inside, creating a unique frame. A beach bottle could also feature different colours of swirled sand or serve as a vase for beach-themed bull rushes. Although glass vases, bowls, and candle holders are a popular component of reception centerpieces, they can sometimes feel too plain (not to mention, disappear!) on a white tablecloth. This photo from A Day to Remember Wedding Consultants & Coordinators (in Vancouver) presents the perfect solution: tie a gauze ribbon in a bold colour around the glassware in a bow. 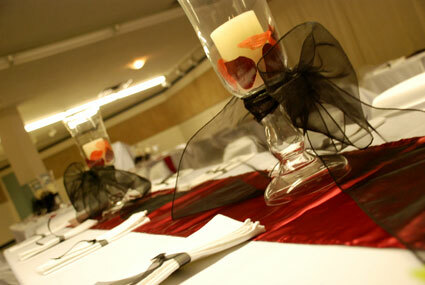 This adds brushes of colour to the table without looking too fussy or taking up too much space.